A short laser pulse is focused on to the surface of a sample to create the plasma. A laser with a good Gaussian profile allows focusing to a near diffraction-limited spot. The tighter the focus, the less laser energy is required to produce the laser-induced breakdown. Typically energies of only tens of millijoules are required. The plasma is emitted into >2ττ steradians, so a fast f/1 lens will collect more light. Sometimes a blocking filter is used to remove any scatter from the incident laser - however, since the incident laser light and the signal are well resolved temporally, a filter is rarely required. An Intensified CCD (ICCD) detector attached to a spectrograph analyzes the collected plasma light. 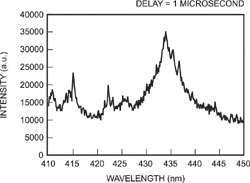 For LIBS, Echelle spectrographs are typically used. For analysis of a wide range of samples, a system based on an echelle spectrograph offers a combination of high resolution and wide wavelength coverage.It is also possible to relay the laser light to the sample and collect the signal by fiber optics. The gating requirements of LIBS are not very demanding. Gate times and delays of several microseconds are typical, so a slow gate ICCD is suitable. The system can usually be operated in internal trigger mode, with the controller board triggering the laser and the delay generator. The intensity of the plasma emission is usually high enough to allow good spectra to be recorded in single scan mode.A typical experimental configuration is shown below. LIBS spectroscopy can be produced from a variety of lasers but typically excimers or pulsed Nd:Yag lasers are used.The high intensity laser pulse interacting with the sample produces a plasma plume that evolves with time from the point of impact of the incident laser pulse. 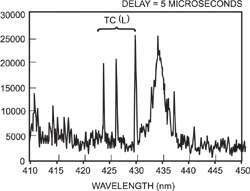 The laser pulse usually lasts for 5 to 20ns.The emission from the plasma plume is collected and analyzed by the detection system.Typically the emission is collected at some distance from the sample to reduce the significance of self-absorption effects or surface effects.The plasma created breaks down all the sample's chemical bonds and ionizes many of the constituent elements.The spectral emission occurs as a result of the subsequent relaxation of the constituent excited species.The spectrum that is observed in the first 100ns is dominated by continuous, intense, white-light radiation; consequently no discrete lines can be observed. The plasma plume expands with time and the excited species relax further.After around 1μs from the incident laser pulse, discrete spectral lines originating from various ionic species start to become visible.The spectra below indicate how the spectral lines evolve over time.The exact timing and the spectral lines vary with the type of sample, the distance from the center of the plasma and the wavelength of the incident laser light, but typically the evolution of the plasma and the changes in its content occur on a microsecond timescale. LIBS is a useful method for determining the elemental composition of various solids, liquids and gases. In the LIBS technique, a high power laser pulse is focused on to a sample to create a plasma or laser spark.Emission from the atoms and ions in the plasma is collected by a lens or fiber optics and analyzed by a spectrograph and gated detector.The atomic spectral lines can be used to determine the elemental composition or the elemental concentrations in the sample.The analysis is similar to that performed by an ICP (Inductively Coupled Plasma) analyzer.The great appeal of LIBS is that little or no sample preparation is required to obtain useful results and the technique is readily portable to the field.